Making abundant risotto has never been a problem in my house. But trying to add liquid the next day and re-heating it to create a "born-again" version typically produces a sub-standard result, there are a few preparations that can be made using leftover risotto that don't make you feel like you are eating leftovers at all. On the contrary, these preparations can be presented as new dishes on their own and their quality, if properly made can be outstanding. One of these simple preparations is called Arancini di Riso, which are risotto balls about the size of a lime or clementine, stuffed with sausage, vegetables or cheese and other delicious garnish bites, then breaded and deep fried. This same preparation in some parts of Italy, is also known as Suppli'. Now because the cooking is really quite fast and enclosed inside of the breaded crust, the rice reheats and remains moist without needing to absorb more liquid and without overcooking. The result is an irresistible crispy bite on the outside that leads to a creamy risotto and a flavorful filling in the center. In fact, it is so good that it is almost not fair to call it a leftover. The surprise bite at the center or stuffing can be totally up to you of course and is best selected respecting the main flavor of the risotto you are using. Normally a good melting cheese like mozzarella or Fontina or even Taleggio or Gorgonzola by itself or paired with a vegetable variation like tomato, tomato sauce, or peas or with a meat like sausage or cooked ham. 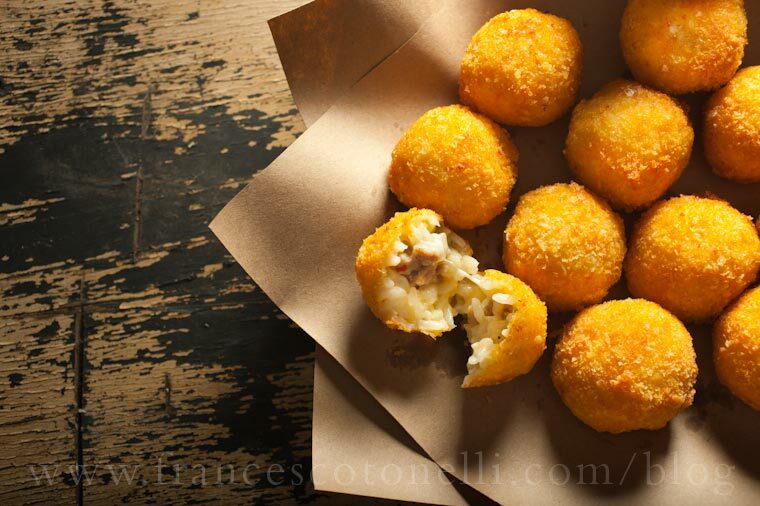 Arancini can be prepared ahead of time and fried just before you plan to serve them. Give it a try, next time you cook more risotto than you can eat and I am convinced that cooking extra risotto every time won't be considered an accident anymore.